Microgaming’s Mega Moolah is synonymous with some of the largest progressive jackpot payouts ever recorded in online gambling history. The simple yet captivating nature of this pokies game makes it all the more appealing to its players, and with four progressive jackpots constantly on offer, this interactive slot title is one we will never forget. The higher the players bets, the better chance he or she has of randomly triggering the bonus round – the round where the four jackpots become active. The jackpots and all other cash winnings are awarded in whatever currency you chose for your casino account. 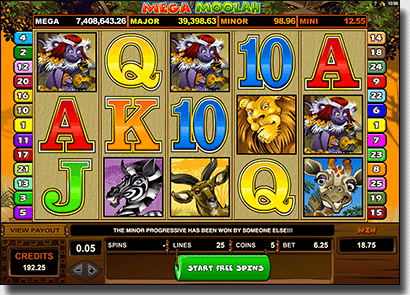 Note: Mega Moolah, along with Microgaming’s other progressive jackpot pokies, can only be played in real money mode. If in practice mode, you will be able to enter the game, however you will not be able to place any bets. The game features the following symbols: the lion (which acts as the wild symbol), the monkey (which acts as the scatter symbol) an elephant, a buffalo, a giraffe, a deer, a zebra, and the iconic Ace, King, Queen, Jack and 10 symbols. Each symbol boasts its own specific payout according to how many of the same symbols are spun across a winning payline. All wins, except for scatter symbol wins, are multiplied by the number of coins you bet per line. All winning paylines pay left to right, except the scatter symbol wins. For further game information, you can access the Mega Moolah rules at www.SlotsMillion.com. The wild lion: The lion icon can substitute for any other symbol in order to create a winning combination across any payline, and will double your wins when doing so. The scatter monkey: The monkey acts as the scatter icon, and if three or more are spun on any reels and in any pattern, the free spins round will be triggered. 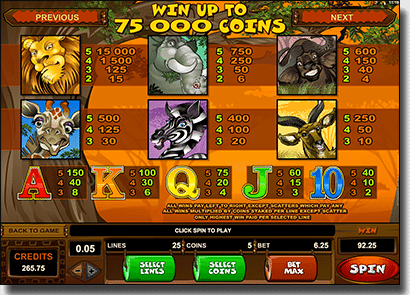 Within this round, players are awarded 15 free spins, and more free spins can be triggered if three or more monkeys are spun again in any pattern, during the exciting feature. All your wins will be tripled during the free spins mode (your total stake bet per line remains the same in the free spins mode as it was in the original game). The bonus jackpot round: Triggered at random, the bonus jackpot round is where the real action begins. A Wheel-Of-Fortune type round, you will get to spin a wheel which contains 20 slots – 10 slots are reserved for the mini jackpot, six slots are reserved for the minor jackpot, three slots are reserved for the major jackpot and one slot is reserved for the multi-million dollar Mega jackpot. Mega Moolah Isis is the sister slots title of Mega Moolah, and it shares the same four-tier jackpot. You can play Mega Moolah Isis at www.Thrills.com. 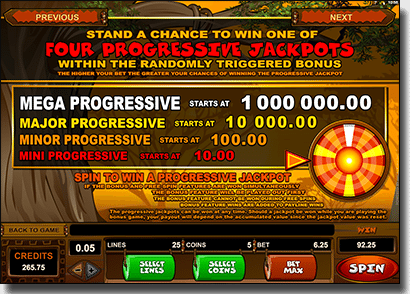 In addition to playing Mega Moolah on your computer or laptop device, this was one of the first real money progressive slot games released on mobile and tablet devices. Mega Moolah is available to play on all the latest phones and tabs, including devices using the Android, Windows and BlackBerry operating systems, and of course the iOS. If you don’t happen to have a more modern smartphone or tablet, don’t fret. 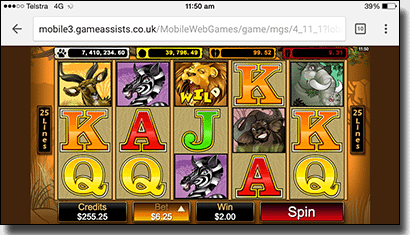 Mega Moolah is a highly optimised mobile slot, and as such, is also available on some older data enabled phones (pre-2007) such as those using the Symbian operating system and those utilising WAP browser technology. Our recommended online gambling sites each own a advanced and full fledged mobile site, using the latest in mobile Internet technology (HTML5 and Flash) to power their graphics, audio and games.